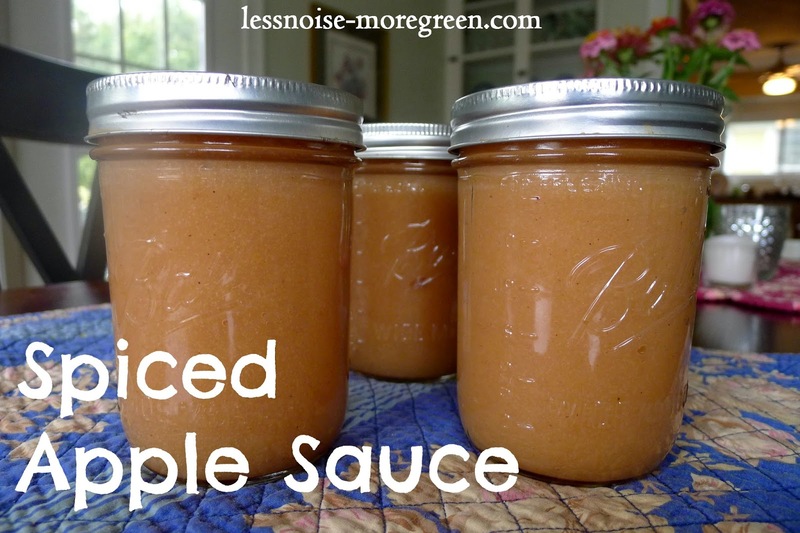 Less Noise, More Green: Sauce, Vinegar and Cake - How 'bout them apples! Sauce is always top of the apple 'to do' list. I usually use this apple sauce recipe, but this year I wanted to spice things up. This sauce has a deeper, spicier flavor and tastes great as a sweet snack, while my traditional recipe makes a sauce that is perfect for cooking and baking. Cook the apples down with the cider until completely soft. Put the apples through a food mill. Return the sauce to the pot and reheat with the rest of the ingredients. Can, using a water canner. Get safe canning instructions, here. One of the dishes I make with the first apples of the season is my Somerset Apple Cake. Is it strange that I always mark the changing of the seasons with dessert? This dessert reminds me of my childhood in England and is so chock full of apples it is more pudding than cake. With all the apple peels I'm creating, I'm making fermented apple cider vinegar. I stuffed a half gallon mason jar with peels and filled it with a water and sugar solution, covering the opening with cheese cloth. I stirred it daily for a week then strained the mixture, putting the liquid back in the jar and covered it with the cloth. I'll keep stirring the liquid and in a few weeks, hopefully, I'll have apple cider vinegar. I know I could just go to the store and buy apple sauce and vinegar but producing these things myself I find to be rewarding and meaningful. It makes me an active participant in the food I feed my family and I see real added value in that. I love this time of year and the change of ingredients a new season brings. Squashes, root vegetables cabbages and winter greens beckon from the garden. It's time to switch gears and get my autumn groove on and making the most of half a bushel of apples is a good place to start.